What Happens When Caregiving Is an Around-the-clock Situation? Home Health Care Millington TN – What Happens When Caregiving Is an Around-the-clock Situation? It’s highly likely that caregiving at first isn’t a 24-hour commitment when you first become a caregiver. Over time, though, your elderly family member’s needs can change dramatically. Eventually, you may find that she does need help both during the day and at night, which can change caregiving significantly for you. It sounds like it’s impossible, but if you can prepare for as much as possible, you’re going to be ahead of the game. You do this by learning as much as you can about your senior’s needs and her current and future health. Talk to her doctor and to other experts about what types of solutions you need to have in place and then make a plan for implementing those strategies. You won’t realistically be able to prepare for absolutely everything, but you can make a good effort. Caregivers tend to throw themselves into the business of caregiving. But that can wear you out over time. You need to be able to learn to pace yourself a bit. That might mean that you hand over some of what needs to be done to someone else. Home heath care providers can help you quite a bit with this. They can also show you easier ways to get more done. Caregiver burnout is a situation in which you have given all that you have to give, but your job as a caregiver is not anywhere near complete. This is what can happen if you don’t pace yourself. All too often caregivers neglect themselves in favor of taking care of the other people in their lives. This is a recipe for burning out, though. If you’re not already taking time away from caregiving, you need to incorporate that into your schedule. This is especially important if your caregiving situation has expanded to an around-the-clock schedule. You have to have time to sleep and time to go be just you, not your senior’s caregiver. Hiring home health care providers, even just for night shifts, can help you to do what you need to do both for yourself and for your aging adult. 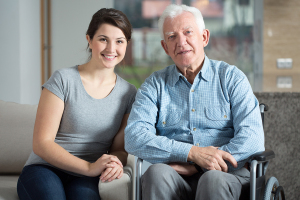 Caregiving ebbs and flows as your senior’s needs change. Eventually it becomes a situation that might feel out of control for you as her primary caregiver. Keeping some of these tips in mind can help you to put the right tools in place to help both you and your elderly family member. For Home Health Care Services in Millington TN, please contact the caring staff at Personal Care Services MidSouth today! This entry was posted in Home Health Care Millington TN, Personal Care Tips and tagged Home Health Care Millington TN. Bookmark the permalink.